When looking at the Best Picture nominees this year, the one outlier among the eight is Clint Eastwood’s latest, American Sniper. American Sniper is a lot of things; it’s the highest-grossing movie of the Best Picture nominees. It’s the movie that broke the record for largest opening weekend in January. It’s the second film that Clint Eastwood directed in 2014 (the first was the critical and commercial disappointment Jersey Boys). But finally, American Sniper is, in my humble opinion, the only one of the eight nominees that is objectively a bad movie. And a dangerous one at that. Even The Imitation Game and The Theory of Everything, while not great films in themselves, still have some admirable qualities to them. American Sniper is a bad movie in all senses of the word. It’s not well made, it’s not well written, not to mention it’s causing a very dangerous political divide in those who have seen it. So what is it doing here in the Best Picture category, along with 5 other Oscar nominations? 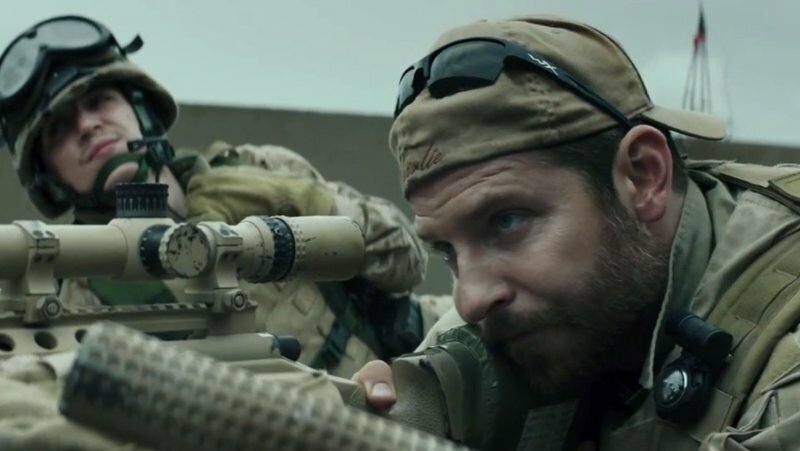 Well let’s look at the subject of our film; Chris Kyle, the deadliest sniper in US history, portrayed here by Bradley Cooper in one of his better performances (that will be my one compliment for this film). Kyle’s claim to fame is killing over 160 people over in Iraq, thus making him an “American Hero,” as many have dubbed him. In the film, many people admirably call him “the legend,” and show him great reverence for what he’s done. He is undoubtedly our protagonist for the film, which is why it’s so troublesome that Chris Kyle is portrayed as an ignorant, racist, sexist, “rah-rah, USA” chanting fool. Constantly referring to the Iraqi people as “savages,” Kyle views the entirety of the Iraq War as a fight between “good and evil,” a description the film all too easily follows along with for the sake of simplicity (Of course things are much more complex, but I don’t want to get too wrapped up in politics for this). The majority of the film is watching Kyle on top of buildings, shooting down Iraqi men, women, and children. The all-too troubling emotion turmoil of the film isn’t that Kyle feels guilty about the masses of people he is killing. No, his emotional arc is that he can’t get over the guilt of all of his fellow troops who he isn’t able to save. This causes him a great deal of mental strain when coming home (this whole arc is shown in the last 15 minutes of the film, by the way), because Kyle is just someone who cares about his country, gosh darn it! (Actual piece of dialogue: “This is the greatest country in the whole world and I’ll give my life to defend it.” Blech). These war-time scenes are juxtaposed with Kyle’s family life, with his wife Taya (played by Sienna Miller), and his two kids (both portrayed, in their early lives, by obviously fake baby props, one of the more egregious parts of this big-budget motion picture which I promised myself I would only address in this one sentence). These scenes follow a very generic pattern of Taya worrying about Chris, Chris not listening to her (because he knows what’s what because he’s a MAN), and then him returning to war. This same sequence happens three times in the film. If I sound a little angry about this, well then you’d be right. It’s just very troublesome when a poorly made film with very dangerous ideals about this country are packaged in such a way that so many people are celebrating it. And not just celebrating it; defending it like it’s the damn US Constitution. Many people are using American Sniper to defend their political beliefs, and are calling anyone who criticizes it “anti-American.” There are two main issues here really; the fact that we can, in no way whatsoever, criticize the U.S. military, and the fact that people don’t realize that this is a MOVIE. Not a documentary about Chris Kyle’s life, but a fictional piece of cinema, taking the life of this man, and constructing a brand new narrative. Albeit a narrative that remains as problematic as this man’s life story anyways. I’ve been struggling with how to even write this column for our Best Picture Profile series. Last year, in all of the nominees, Nina and I were able to find positive aspects in all of those films, things to find worth in and to celebrate in the world of cinema. Which is why it’s so sad to have American Sniper as a Best Picture nominee. This film is nowhere near one of our 8 “best films” of the year. It’s not even in my Top 20. All I can say is, based on the public response to this film, if American Sniper does win Best Picture, it will show that we are living in the America I most fear to live in. A country that is so quick to jump on the bandwagon of defending the free speech to criticize other countries (“Charlie Hebdo,” The Interview), yet can’t even fathom people criticizing a film that insults our own values here. There are many other films in the Best Picture race that reflect the America we should be living in. Let’s not support American Sniper, the film that reflects the worst parts of what it means to be an American. I think this piece fails to consider the film in a more nuanced way. I am in no way saying the film should win an Oscar, but I do think that the problems you have with the film seem more about your personal political beliefs clashing with what’s onscreen which, as you mentioned, is fictional, than about how the movie could be ideologically flawed. Even though the film portrays the main character as a racist sexist patriotic sniper, Eastwood is not trying to make you into any of these things or say that these qualities are ideal; he is simply portraying the very real fact that people like this exist and act this way. As for criticizing the plot, and the scenes with his family, just because you find them generic doesn’t make them any less true or real, it just means maybe you can’t find it within yourself to relate to the situation, and so maybe you shouldn’t be commenting on that aspect. I think that you are concerned about public opinion which is valid but you are confusing this public response with the filmmakers intent, and ignoring the different ways that the film could be read. This is a very important distinction to recognize and acknowledge, especially if you aim to critique films on a regular basis.